So, you finished your interview, went home excited to hear back, but now what? Maybe it’s been a few days (or more) and you haven’t heard anything. 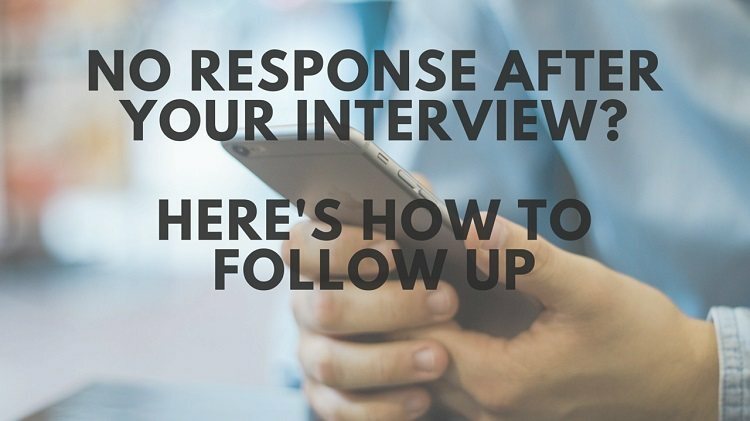 I’m going to show you exactly how to send a follow up email after your interview if you’ve gotten no response, with examples and templates. One WARNING first though: Don’t use these follow-up templates to email the company after one day! It takes time for the company to interview people and make decisions. If it’s one day after your interview, you should be sending a “thank you” email instead (I’ll cover that too). Follow up email subject lines are important. They decide whether your email gets opened, and how fast. I’d recommend following up with whoever said they’d been in touch. Or follow up with whoever you’ve been talking to for scheduling, etc. The best subject line, and the one that’s going to get opened faster than anything else, is to simply reply to the latest email between the two of you. They’ll open it immediately because it’ll appear as part of the previous conversation. Much better than starting a whole new email for this. I’d keep it simple and straight-forward. Don’t be shy or unclear. Tell them you’re excited to hear back and wanted to check if there’s an update or a decision yet. This is the best follow-up email if you already sent a “Thank You” email. Run spell-check and proofread everything before sending your follow up email. Don’t risk having a mistake in your email. Note: This strategy above is best if you’ve already sent a “Thank You” email a day after your interview. I’m going to give you one in this article coming up in a minute, so keep reading. We can’t go back in time though. So if you didn’t send a “Thank You” email after your last interview and a few days have passed, I’ll show you what to send… You just need a follow up email that also thanks them for interviewing you, since this is your first contact with them. The interview follow up steps above will still work, but we need to add one piece near the start. After greeting them by their name, you should thank them for taking the time to interview you. I’d mention the specific date you spoke to remind them, too. Something like this: “Dear Jeff, thank you for taking the time to meet with me on Thursday”. Then you can jump right into step #4 above. Say you enjoyed learning about the position you discussed (be specific and refer to it by the job title). Then tell them you’re hoping for an update. Be clear and direct, and ask for what you want. Finish by thanking them, and ending the email with your full name, just like in the steps above. No. Don’t complicate it. Be up-front and say what you actually want, which I assume is an update on the status. This email is your best shot at getting that update without seeming pushy, anxious, insecure, desperate, or any of the things that’ll turn a company off. Either way, you reminded them you’re waiting for news and still interested, which is important if 4-5 days have passed because companies love to hire people that seem genuinely interested. If you want to know why, or what else a company looks for first, you should check out my complete list of job interview tips. It’ll help you understand the company’s mindset a lot better. What If The Company Says They Don’t Have Any News Yet? This is a pretty likely scenario, they respond to your email and say they’re still waiting for something to happen. Sometimes they’ll be specific on what that ‘something’ is but usually not. Either way I’d respond with something to keep the conversation alive and give yourself an opening to follow up again if needed. What If The Company Still Hasn’t Responded To Any Emails After The Interview? First, make sure you’ve waited a one or two days for a response (not counting weekends). Give them some time. Then send a followup to the same person, replying to the same email you already sent and keeping the subject line. If you still haven’t heard back at that point, I’d be very patient. There’s a chance someone necessary for the decision is on vacation or the person you emailed is extremely busy. If you get nothing after 48 MORE hours, you can email somebody else in the company. I might wait even longer though. Really, at this point, you’re not going to gain anything by sending more followups one day sooner. So if in doubt, just wait a bit. I might wait a full week at this point if it were my job search. Pick the next logical person and send them an email. If you were emailing an HR person before, try the hiring manager or somebody in the department you interviewed in. Or the other way around – if you’ve been emailing with the hiring manager before the interview and they’ve gone silent, try checking in with HR. It’s a bit long, but it’s specific which means it’ll get opened and the person on the other end will know it’s not spam. The contact’s name is who you’ve been emailing previously – the person who isn’t answering your emails. If you follow the advice above, you will have great emails to send after any interview – from a phone interview to a final stage in-person interview. Tip 1: If you’re still not 100% confident about anything above, you can always have a friend or family member look at your follow-up email before you send it out. They can double-check everything and tell you if it sounds polite and is clear on what you’re asking. Sometimes it’s normal for it to take 1-2 weeks for a response after your interview. For example, maybe you were the first person they interviewed and they need to talk to a couple other candidates before making a decision. So this will save you a lot of stress because you’ll know whether it’s time to follow up or not, and you won’t be worried if you’ve gotten no response after a couple of days.